Also known as leadership behaviours, or competency frameworks, these are models that frame a set of core behaviours, such that people, like leaders, managers, coaches, and members of the learning and development or HR teams, can have a structure within which to work, and set behavioural expectations. Competency or behavioural frameworks are not ‘values frameworks’, yet these can get mixed up. At my360plus we believe in evidence-based frameworks and in clear communication of behavioural expectations. We also believe that a good 360 feedback questionnaire or survey should not expect the survey respondents to be experts in the behaviours. What’s the evidence base for the my360plus framework? My360plus is based on the peer-reviewed research work led by Professor Harry Schroder at Princeton University and London Business School. We work with experts trained by Prof. Schroder. What’s the my360plus Global Competency Framework? The evidence-based Global Competency Framework we offer is based on the ‘High Performance Behaviour’ Framework or HPBs, which are clear and simple descriptions of the needed behaviours in a VUCA world (VUCA stands for ‘Volatility’, ‘Uncertainty’, ‘Complexity’ and ‘Ambiguity’ – and summarise the global shift as a result of new technologies, such as IT, Energy, Manufacturing and Life Sciences). There are 12 leadership behaviours, grouped into four clusters, with five levels per behaviour. They cover the way leaders Think, Involve People, Inspire Others and Deliver. These link to customers’ typical Leadership competency/behaviour or other developmental models; they have been used internationally by the Forton Group and its partners. The research underpinning the leadership behaviours comes from peer-reviewed work done by Professor Harry Schroder at Princeton and London Business School. The research team showed empirically the impact of these specific leadership behaviours on organisational performance during increasing complexity and rapid change. These were shown to be the differentiators between high performance and merely average. Where organisations have already defined their own leadership capability models we can map existing competences into this model and create a good fit. What’s the ‘Schroder Model’ evidence? Professor Harry Schroder (Princeton University) set up a team to research the competencies needed to deliver leadership in an increasingly volatile, uncertain, complex and ambiguous (VUCA) world of work. This research was rigorous and ground-breaking and led to the book “Managerial Competence: The key to excellence which was featured in Personnel Today’s “seven must-read books”. Many competency/behavioural frameworks have now adapted or used this fundamental model, in some cases changing the names of clusters or competencies to suit the organisational context. Other team members went on to research in areas linked to these behaviours, such as Richard Boyatzis who co-wrote books with Daniel Goleman on Emotional Intelligence and Emotionally-intelligent leadership (e.g. The New Leaders). The inspire cluster, for example, offers clear links between emotional intelligence and these behaviours. What this framework doesn’t do is cover basic managerial functions, such as reading a balance sheet, managing a budget, or technical excellence. These are assumed as givens in leaders and managers. Limitation – Uses negative behaviour and/or sets a climate which deters or devalues the use of the behaviour by others. Developing Strength: the behaviour is used at the highest levels, but inconsistently or consistently at lower levels. 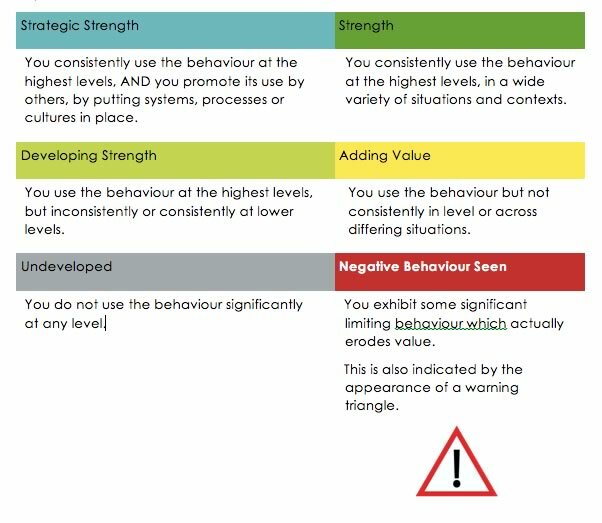 Strength – In addition, uses higher order behaviour. This may use the behaviour in a broader way, which encompasses the work of other teams, units or organisations, or it may be a higher level of behaviour. Strategic Strength – In addition, implements strategies, systems or processes to build value for and perpetuate the use of the behaviour and the contributions it can make. What's the my360plus development approach? Colleagues provide feedback on the 12 critical Behaviours set out in the ‘Model’ section of the report. They rated both the level the participant operates at and the frequency they observed the Behaviours, as these directly relate to level of performance at work. Both level and consistency are critical.